“In November 2014, eleven women died at a sterilization camp in Chhattisgarh. In June 2016, a seventy-five-year-old man was left to die because he could not afford a bribe of Rs 50 at a government hospital in Kolkata. That same month, a gang that duped women into selling their eggs for surrogacy was busted in Pune. Dr. Kamal Kumar Mahawar examines the roles of the government and the judiciary in policy-making in medicine and explores how the Indian Medical Association’s code of ethics is out of sync with modern times. Analyzing the connections between power and knowledge, and exposing the dangerous ways in which they play out in medicine, the book asks an all-important question: is it possible to be an ethical doctor today? News of what is wrong with our healthcare keeps surfacing from time to time and reports of unethical and corrupt practices amongst doctors have now become commonplace. Though one could argue the situation with medicine is not much worse than other walks of life, as a doctor, I feel compelled to at least set my house in order. Yes, a lot of the doctors today indulge in unethical practices but we don’t pass out of medical colleges aiming to become such a doctor. What then is the reason that many doctors cannot practise ethically in contemporary India? In this book, I have resisted the temptation to simply list the gory details and ask doctors to become more honest. Such an attempt would not be very successful in our society where corruption has become a way of living and any attempt to fight it is usually dismissed as impractical idealism. This book would have been incomplete without a comprehensive list of all that is wrong and unethical within our healthcare and as a matter of necessity, I have had to enumerate them all. If patients know what is happening, they might be able to protect themselves to some extent. However, I have attempted to go beyond that and that I believe is the hallmark of this book. I have tried to examine the forces that make it impossible for a doctor to practice ethically. Moreover, though we are quick to criticize our private doctors for their failings and there is no reason why we shouldn’t, not much time is spent evaluating the effort of our government and public sector doctors. It is almost as if it is alright to be inefficient and incompetent as long as you are not corrupt. One of these days, we will have to recognize in India that lack of action and accountability is probably the most rampant form of corruption in India and certainly the worst. The book examines our public sector healthcare provisions or lack there of. Healthcare is a complex web where each of the players– the government, the industry, the doctors, the hospitals, and the public, have a defined role to play. In this book, I examine the steps various each stakeholder needs to take if we are to see better healthcare provisions for the people in the future. A major illness is one of the most unfortunate things that can happen to anybody. In civilized societies, we should have mechanisms to look after each other in such times of need. Doing so will preserve our social fabric and give individuals a sense of belonging. Though the task is herculean, it cannot be impossible to achieve provided we all engage in serious introspection and that is precisely what this book attempts to do on behalf of us all. 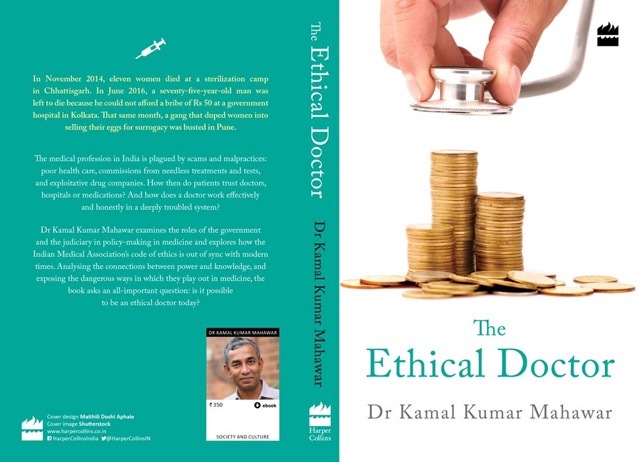 Dr.Kamal Kumar Mahawar is a practising medical doctor who has had the opportunity of reflecting on a range of ethical and systematic issues that plague health care in India. He writes regularly on subjects pertaining to Indian health care in India Medical Times. Following his graduation from Calcutta Medical College and post-graduation from Postgraduate Institute of Medical Education and Research, Chandigarh, and University of Liverpool, Dr Mahawar has been working as Consultant General and Bariatric Surgeon with National Health Service (City Hospitals Sunderland NHS Trust), United Kingdom. He is actively involved with research and is the editor of several reputed scientific journals. Dr Mahawar is also the co-founder of science portal Webmed Central.